There are several Jain relics spread across Pakistan. Professor Noel King, Professor Emeritus of History & Comparative Religion of University of California Santa Cruz had visited Pakistan briefly late last year and has kindly forwarded details of his finds of Jain relics. He had made a detailed visit several years ago but had to leave in a hurry due to bad health. Last year's visit was very brief and details given are a little scanty neverthless interesting. Taxila is one of the most important archeological sites of Asia located along the Silk route in Punjab Province of Pakistan. It flourished during the 1st to 5th century AD when it became famous as a major seat of learning of Buddhism. 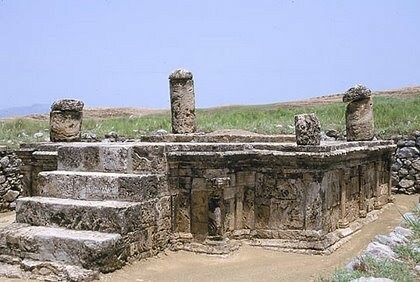 The Stupa shown above is located near the city of Sirkap (severed head) along side many other Buddhist relics. 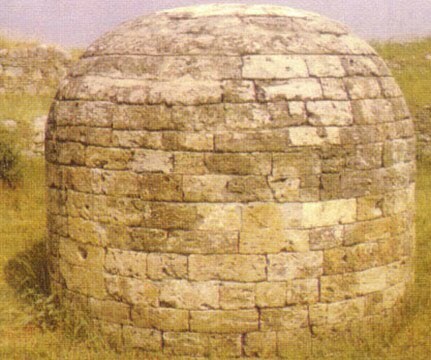 A request has been made to find out why it is called the Jaina Stupa but no information has been forthcoming. The Lahore Museum has a fine collection of Jain relics mainly of the material collected from the city of Gujranwala and Darkhana. It is believed that Mr Raghavji Virchand Gandhi, the first person to represent Jainism abroad and who attended the first Parliament of World Religions in 1893 in Chicago was supported by the Jain center from this area. An example of another complete murti. The inscription underneath is in Urdu. 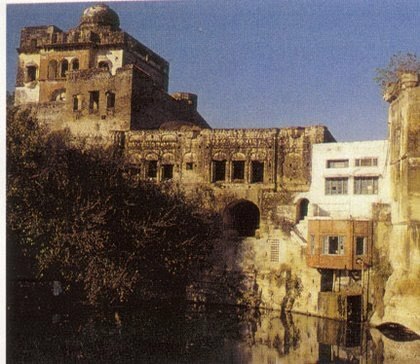 On the road from Rawalpindi to Lahore in the Pothohar area, there are so-called 'Kafir Kots', ruins of old temples. No details of these temples are available but the architecture seems to be Jain. On a near by hill top about 2000 ft high there is a small lake called Shiva Tears for Sati. There are ruins along the hill side up to the top and sorrounding the lake. Many of the building look like monasteries. There is a Shiva statue in the temple in the photograph below but Prof King suspects that the statue may have been of a tirthankar and that a Jain temple was converted to a Hindu temple. Just a few dozen meters from the Shrine of the Double-Headed Eagle sits the Jain Stupa, a relic of the Sirkap city period (2nd century B.C. to the 2nd century A.D.). The shrine is badly ruined. Nothing of the superstructure survives. The persepolitan columns with lion ornamentation that sit on the four corners were brought here from the ruins of the courtyard. 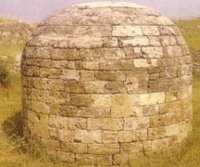 A Jain sanctuary in Taxila, looking like a stupa. Guru Mangat in Lahore Cantt. 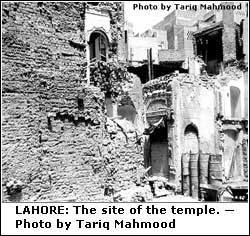 Images & Foot Prints & Wood Work since removed to Lahore Museum. Jain Shwetamber Dadawari Crimination site of Jain Samadhi Dada Guru Jin Kushal Suriji on a sand and an Inn. Jainism has started spreading its tentacles outside India in the middle of 19th century. However its traces could be found there even in the early period. it is found that Auradhapura a place of pilgrimage in Srilanka islands and an abode of Buddhism with viharas, was also a place of Jaina Basadis. Further Janakapuri (Mithilanagari) in Nepal were historically the birth place of Bhagawan Sri Neminatha and Sri Mallinatha, the 22nd and 19th Tirthankaras and thus possibly was the bed of Jainism. Sri Vishvambaranatha Pandyae who was the governor of Orissa has mentioned Leningrad and Tashkent in Russia showed the heritage of Jainism. Jain saint Muni Manibhadra visited Tashkent. A Jain idol belonging to the 16-17th century was found during excavation in a place called Astrakan near caspian sea of Soviet Union. Dukobarsi, an ethnological group in Russia in 18th century were known for following the principles of Jainism (Peace and Non Violence). It is said that Jainism was found in specks in Egypt - Babylon, Alexandria and Greece. The idols, inscriptions, copper plates and picturesque documentations narating the heritage of Jainism are found in the museums of Switzerland, East Gremany, England, America and Denmark. The ardent followers of Jainism (Digambara, Swethambara, Sthanikavasi, Terapanthi and Oswal) have constructed many temples in Afro-Asian and European countries in the recent past. Kenya, Japan, Canada, West Germany, Britain, Singapore and America. The beckon of ahimsa and the axioms of Jaina principles have spread all over the globe striving for the cause of humanity. Jainism crossed India from South India at about eighth century B.C., if not earlier, and become one of the most important religions of Ceylon, which was known in those days by the name of Lanka, Ratnadvipa or Simhala. The Mahavamsa (10.65-70; 33. 43-79) refers to the existence of Jainism in Ceylon even before the arrival of Buddhism. According to it, Pandukabhaya built a house at Anuradhapur for the Nigantha Jotiya and Giri and some more Niganthas, Jain tradition takes the history of Jainism in Ceylon even prior to its Aryanization, or the Arrival of the Aryans. Ravana, a king of Lanka long ago is said to have erected a Jain temple there at Trikutagiri. Another statue of Parsvanatha, the 23rd Jina found in the caves of Terapur is also said to be from Srilanka. Jainism was a living religion of Srilanka up to the 10th A.D.
Kalakacarya, another Jain monk, is said to have visited Burma or Svarnabhumi (Uttaradhyayana Niryukti, 120). Rsabhadeva is said to have traveled to Bali (Bacteria), Greece, Svarnabhumi, Panhave (Iran), etc. (Avasyaka Niryukti, 336-37). Tirthankara Parsvnatha also went to Nepal. The existence of Jainism can also be proved in Afghanistan. Tirthankara images in the Kayotsarga, or meditating pose have been found in Vahakaraj Emir (Afghanistan). Digambara Jain monks have been in Iran, Siam, and Philistia31. Greek writers also mention their existence in Egypt, Abyssinia and Ethyopia32. It had also propagated in Kabul, Campa, Bulgaria and some other foreign countries. If anyone has access to more accurate information on jainism in Pakistan please let us know.